He can be used to decorate sweaters, scarves, hats, scrunchies, head-bands, shoulder bags, backpacks, sloppy joes (sweatshirts), or could even live in your doll house. Click here for instructions on how to knit i-cord. 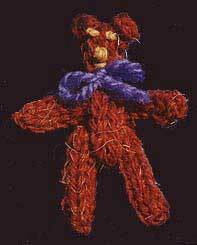 Teddy was made with a scrap of dk weight yarn on 4mm needles and measures approximately 7½ cm (3 inches) in height. Cast on 4sts and work 7 cms i-cord. Break yarn and thread through sts. Pull tight and fasten off. Cast on 4sts and work 8cm i-cord. Fasten off as above. Cast on 4sts and work 5cm i-cord. Fasten off. K1, P1, K1 into the st, turn, slip 1, k2tog, psso. Fasten off, leaving ends long enough to sew ears to teddy’s head. Tie ends of thread together and pull tight so that right side of knitting shows on the outside of the bobble. Join the ends of the body i-cord to form a loop. Fold, so that the seam is at the centre back. Thread legs through the base of the body, fold down and stitch so that the legs stay in place. Thread arms through body above legs and stitch in place. Wind yarn around the neck, stitch on ears and embroider face. This pattern is Copyright © Sarah Bradberry 1999, all rights reserved.